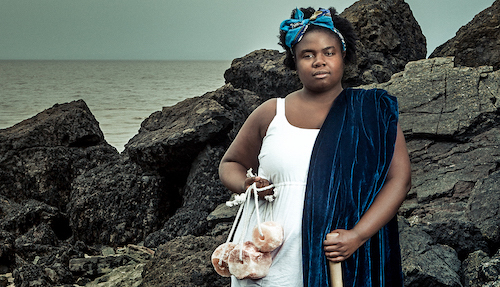 Selina Thompson’s salt., curated and presented by The Theatre Centre and Why Not Theatre for the 2019 Progress Festival, is a sharp, fierce and whimsical piece of storytelling. Thompson takes us from the UK to Ghana to Jamaica and shares with us her journey of discovery as she examines and embraces her part in a larger diaspora. This journey is one of grief, of learning to navigate the turbulent waters of a devastatingly brutal history, and to make peace with the concept of home. Thompson shares the stage with salt rock. At the top of the show, it is a hefty lump. As she relates her experiences aboard a cargo ship, retracing the route of the Transatlantic Slave Triangle, trying to connect to her ancestry, she uses the rock to demonstrate the full weight of oppressive energy that bears down on her. She smashes and scatters it, the shards and dust strewn about the stage—a potent physicalization of abuse and suppression yet also of the healing that can be found in this abundant mineral. On the ship, tense and diminished by the ship’s white captain—who demands to be referred to as “Master” (a word fraught with dense, horrific connotations)—there is a searing and hypnotic sequence where Thompson takes us along a chain of suffering. The forces pressing down on her run deeper than a racist bully at the helm of a ship. With insightful text and striking gestures, Thompson evokes the treacherous roots of capitalism and the larger spectre of colonialism that looms over it. A story like salt. helps me to put my life and experiences into a necessary new perspective. As a white male, born into reasonable comfort and acceptance, I have not had to contend with any overt systemic oppression. And yet, Thompson is such an open and generous performer, I never felt like an outsider. Thompson and director Dawn Walton take take great care to foster a rich, vibrant and welcoming atmosphere that appeals to all of the senses. Incense burns. There is vegetation. Sleepdog’s sound design is an always-present yet subtle mood setter. Cassie Mitchell’s lighting seems queued to Thompson’s own energy. And then there is the salt itself—ever-present and tactile. While I don’t personally feel the effect of the history Thompson carries with her, I can recognize it. And with recognition comes the possibility to be more aware, more empathetic, more responsive to the needs of those around me. That is the hope, anyway, and it is the gift Thompson offers for those who choose to accept. Knowing that we sometimes need physical reminders of the promises that we make to ourselves and each other, she offers each audience member a small, tangible token of her journey to take home us. It sits on a shelf in my home and Thompson’s salt. has found itself a place in my psyche. Photo of Selina Thompson by Richard Davenport.